We’d like to send a huge ‘thank you‘ to our friends Gavin and Melissa for stepping in and helping with the co-hosting duties! Please make sure to follow them and check out their Etsy shops to show them some love! Remember! Gavin is selling his Inktober prints and proceeds will go to helping victims of Hurricane Maria in Puerto Rico. Check out his Etsy shop for more info. Special features on DVD and Blu-rays are usually some of our favorite things to watch because they give you a look into what it takes to put a film together. Framestore is the Oscar and Bafta award-winning visual effects studio behind the visual effects of Guardians of the Galaxy. 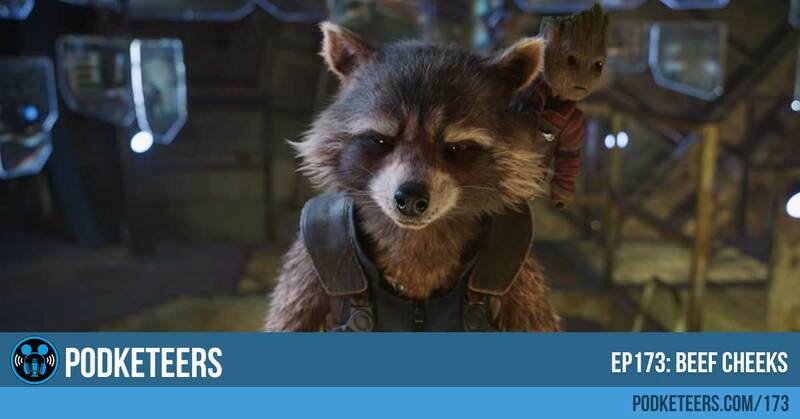 In the video below you will see a quick breakdown showing you exactly how much goes into creating characters like Rocket and Groot. We talked about the rumor that a Moana overlay may be coming to the Enchanted Tiki Room. In general, we like Moana and think overlays can be fun but the Enchanted Tiki Room is a very unique experience. There is not much in Moana that lends itself to singing birds and Disney actually already tried something similar when they added Iago to the Tiki Room at Walt Disney World. What do you think? DO you think a Moana overlay would go well in the Tiki Room? Let us know in the comments section below! If you never had a chance to see the show we found a video on YouTube. Back in May (2017) a comic book was released that made Mission: Breakout at California Adventure officially part of Marvel canon. The comic tells the story of the Tanleer Tivan, The Collector, and introduces you to his fortress. The comic can usually be found at ‘Off the Page’ at California Adventure but we’ve included a link to Amazon (using our affiliate link) in case you’d like a Kindle copy. In case you missed it, we uploaded a new video to our YouTube channel! It is a video of the Frightfully Fun Parade at Disneyland as part of Mickey’s Halloween Party. The video also includes several “fun facts” about the parade itself. What is your favorite float of this mini parade? Check out our YouTube channel below! We would love it if you subscribe!